I have a student who is constantly "crouching" in his chair with both feet in the seat. He also frequently slams his body against the back of the chair with great force and likes to sit with his chair tipped back with the front legs off of the floor. This may not be a problem sometimes but this particular student is unable to focus on anything while he wiggles and rocks in his chair, he gets so caught up in his movement that he zones out of everything else. I wanted to try a T-stool with him because it would force him to keep his feet on the floor to balance, allow him to wiggle a little bit, and since it doesn't have a back it would stop his body-slamming. My daddy, master classroom carpenter, came to the rescue once again :-) He built this T-stool for one of my students using the top/seat from a broken bar stool. 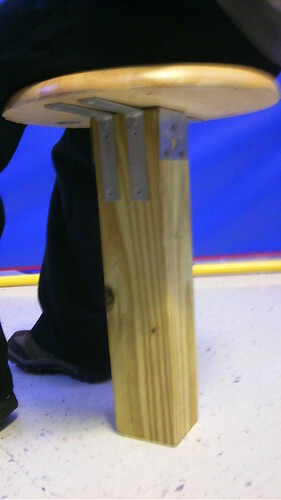 He made the base (the "leg") wider than a typical T-stool but so far it works very well for my student. I work with quite a few students that would benefit from a seat like this. Definately worth a try. Great thought. I like it. My son has a lot of trouble sitting still. Would this kind of seat work well, you think? I had a student a few years ago that was constantly movement, looking for new and interesting sensory input, and our school O.T. brought in a T-stool for us to try with him. It worked great for the first few times he used it, but then he got stuck on trying to sit on it while holding his feet up and attempting balance. However, we did have some other kids that were not quite as active, more just figiting, that would go get it to sit on while doing seated work and it was awesome for them. Unfortunately those guys didn't have O.T. services so she had to take it back eventually. I had forgotten about that thing, and in this economy where supplies and equipment are scarce I am always looking for DIY items , so tahnks for posting this! We have a student that doesn't sit with his chair pushed in, constantly turns around to poke IA's and the teacher, and often puts the front legs on the back of his shoes (which he doesn't like to keep on). We bought a t-stool for him that never really stuck. After reading this I wonder if one with a wider base might work better!